It's about time I write a short tutorial on adding RAM to a Model 100. Click the thumbnail photos for a full-screen image as you read the tutorial. 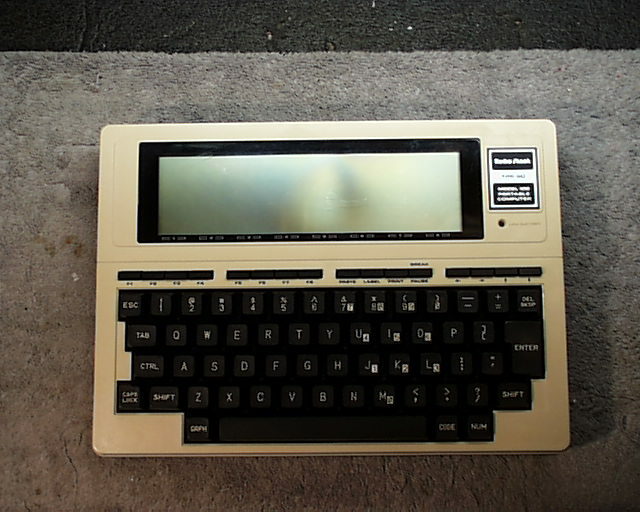 The Model 100 was initially sold in 1983 as an 8K RAM machine. 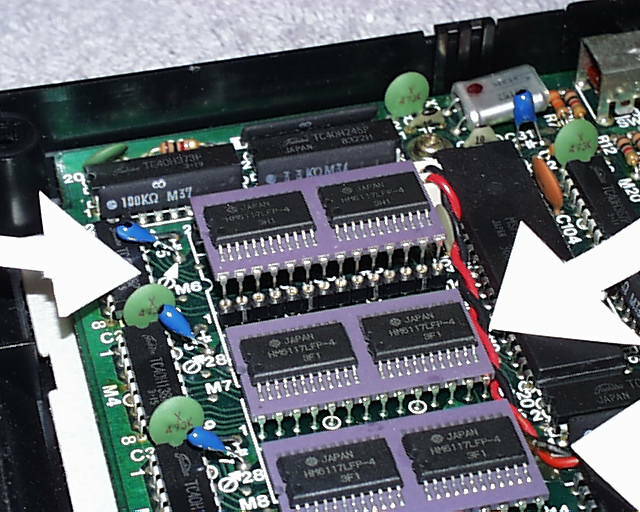 It was and is expandable to 32K using 8K RAM Modulesmore than just a chip. Today, you can find Model 100s in 8K, 16K, 24K and 32K configurations. The 8K RAM Modules are available from only one source, Club 100 at www.club100.org. Another popular practice is to acquire several Model 100's, then pull the spare 8K RAM modules from the spare machines to populate your active Model 100. First of all, you need to dump everything out of RAM. This is called a cold start. The fastest way to do this is to turn the machine OFF. Hold down on the ctrl and break/pause key, and while holding the two keys, turn the machine ON. There is an easy way to tell the installed RAM in a M100 or T102. Invoke BASIC. Type the following statement and press Enter. To get to the RAM area of the Model 100, you must split the case. Start by turning the unit over. 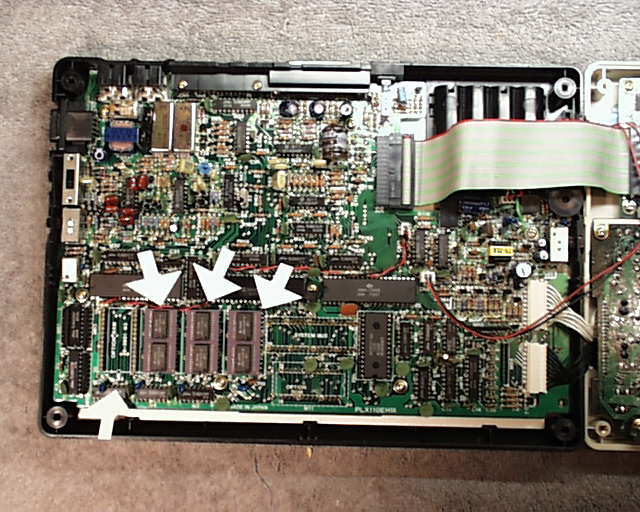 Next, turn off the MEMORY POWER switch (see middle arrow) and remove the four case screws. 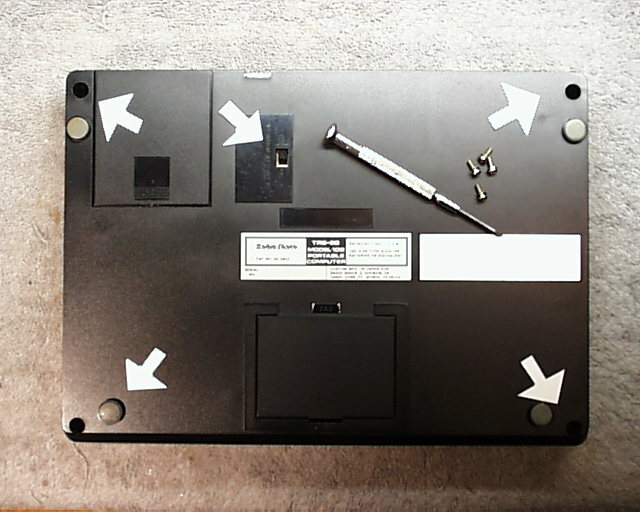 Set these particular screws aside as they are different than most of the screws on the inside of the machine, although you will not have to remove more screws to add RAM modules. There is a trick to splitting the Model 100 case: The two halves of the case are held together by plastic notches in the middle of the edges. After removing the case screws you simply have to know where to push in on the case edges to split the case. Turn the Model 100 upside down, remove the screws at the four corners. Turn it right side up, like you are going to use it. Grab the left hand edge and rock it up onto its right hand edge. The bottom will be facing your left and the top to your right. Using your left hand, push down on the middle of the top edge of the bottom half and the same on the front edge facing you ... again, pushing in on the bottom half, only. With your right hand, pull the top half away from the bottom. The unit will split like a clam shell and lay open, easily. And don't pinch the keyboard wires putting the case back together. With the case laid open on the famous Club 100 work bench (complete with towel), let's identify the RAM area. 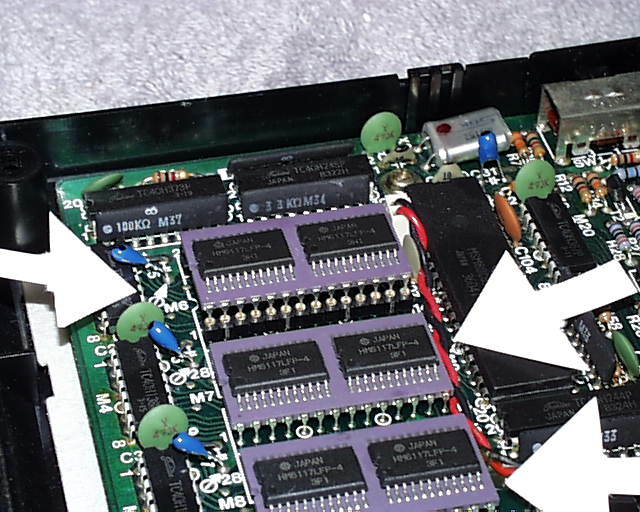 You will note three arrows pointing to RAM modules and one (albeit a bit hard to see) pointing to an empty socket. You are looking at a 24K Model 100. From right to left we have 8K, and them another 8K making it 16K, and them another 8K making it 24K. This particular motherboard was manufactured as a 24K unit but you will find 8K and 16K units in the field. And, believe it or not, there are some 32K units. These were the last Model 100's built. And then came the Model 102, but that's yet another story yet to be told. 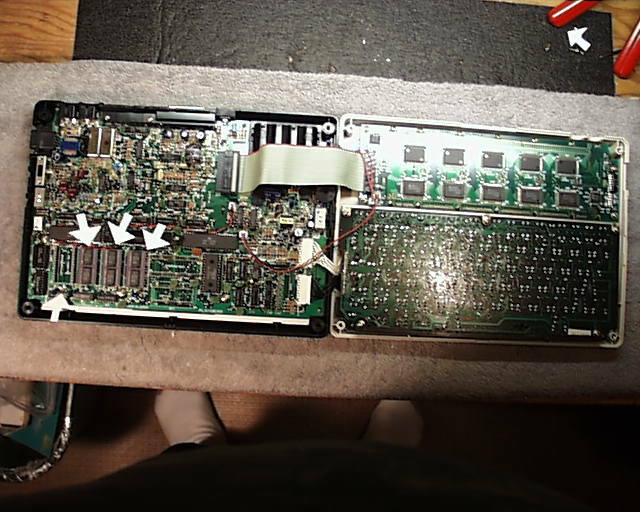 In this photo you see a stock Tandy/Radio Shack 8K RAM module sitting on top of the empty RAM socket. You will note 40 pins extending out of the bottom of the moduleeach pin going into a hole. This is a very important stage in the process of added an 8K RAM module. Make damn sure that each and every pin goes absolutely straight down into the center of its hole, or else when you apply pressure, you will bend a pin. What I do is use both hands. The finger of one hand holds the module down while the other hand commands a tiny screw driver. I lightly push and pull each pin until it is absolutely over its hole. I do one side at a time. As the pins of that side align, I apply a small bit of pressure on the module, pressing the pins a tiny way into their holes. I then change hands and concentrate on the other side. Also, it is common to have to press the entire RAM module to one side in order to get the other side to line-up with the holes. The final word is to take your time and do a perfect job, cause you really want to do this only one time, especially if you have never done this before. But trust me: you can do this. Okay?